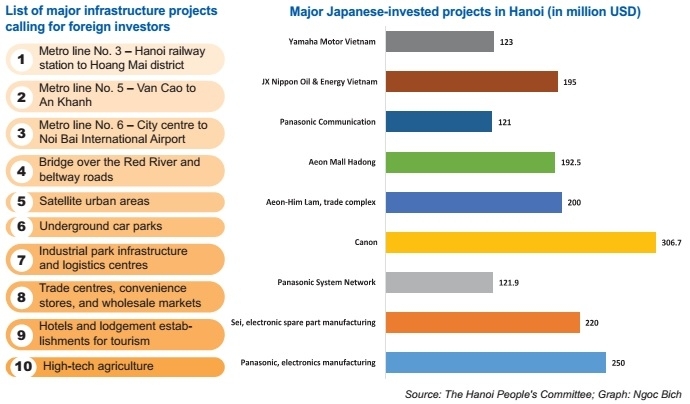 In pursuing its ambitious smart city goal, Hanoi has announced – for the first time – a list of sectors to be prioritised for Japanese investment. The focus lies on Japan’s expertise in industry, environment, high-tech manufacturing and agriculture, IT solutions, and energy efficiency. In only a few days, Japan’s Nidec Corporation, a leading global high-tech company, will receive its investment certificate to invest over $400 million in energy-saving motor and energy-saving actuator research and manufacturing at Hanoi’s Hoa Lac Hi-Tech Park. The investment, following Nidec’s Ho Chi Minh City projects that have been in operation since 1998, shows the important role that Hanoi plays in the firm’s Vietnam strategies. According to the Hanoi Department of Planning and Investment, unlike in previous years, the city lists prioritised investment sectors for each foreign investor based on their expertise this year. Hanoi’s foreign investment strategy until 2020 sees Japan being among the city’s most active foreign investors, along with South Korea, Singapore, Taiwan, the US, the EU, the UK, Australia, and New Zealand. “High-tech manufacturing will be one of our focuses with regard to attracting foreign investors, including those from Japan. Hanoi wants to co-operate with nations and businesses through partnerships in investment, business activities, and transfer of new technologies in developing a smart city,” a senior official of the Hanoi People’s Committee (HPC), told VIR. With the change, Hanoi hopes to increase its attractiveness for as well as quality of foreign direct investment (FDI), in order to propel its urbanisation. Towards this and other development targets, the city also seeks to attract more FDI by 2020 in real estate, technical and trade infrastructure, services, IT, electronics, and research and development. 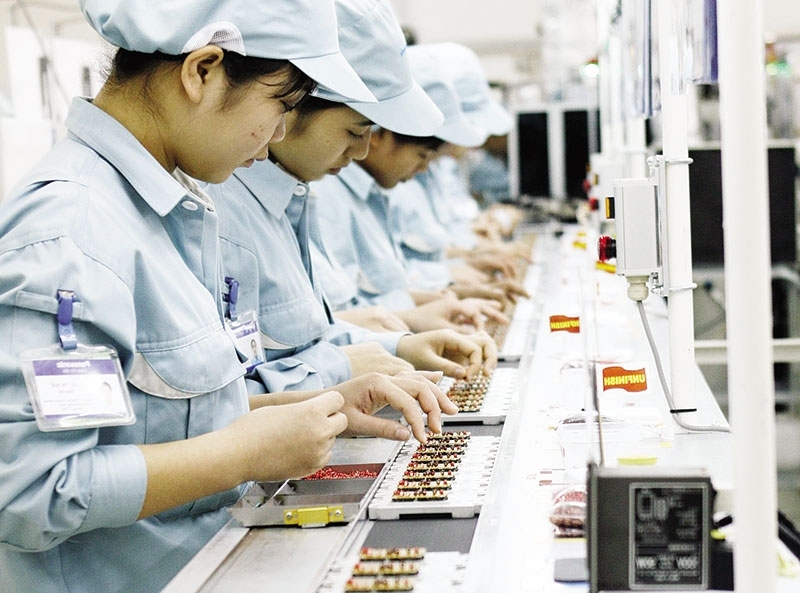 Currently in Hanoi, manufacturing and processing attracts the highest amount of Japanese investment, accounting for 68.1 per cent of the total sum, with accumulated total registered capital of $3.67 billion. This is followed by Japanese investment in real estate ($252.2 million in total registered capital), retail ($320 million), sci-tech activities ($200 million), and construction ($184 million). HPC has estimated that the city will need to attract around $110-114 billion worth of investment to realise its ambitious development targets by 2020. “By 2020, we aim to reach the gross regional domestic product (GRDP) growth at 8.5-9 per cent on average, GRDP per capita of $6,700-6,800, and attract $10-15 billion in FDI – of which $3.5 billion is targeted for 2018,” the HPC official said. In anticipation of local huge potential, a number of Japanese enterprises have been expanding in and to Hanoi. “In recent years, Japanese investment has focused on consumer goods, services, and real estate, reflecting the growth of Vietnamese purchasing power,” Takimoto Koji, chief representative at JETRO’s Ho Chi Minh City office, told VIR. “We are studying opportunities to invest in real estate, particularly in Ho Chi Minh City and Hanoi,” said Hiroshi Karashima, CEO of Sumitomo Corporation Vietnam LLC. Though it has no production base in Hanoi as yet, Japanese air-conditioning giant Daikin Industries is targeting the city as a major market, in addition to Ho Chi Minh City. “Our sales in Hanoi have been good. We have opened a showroom in the city to promote the brand and are looking forward to even more future sales when our $100-million factory is put into operation in May 2018,” Ly Thi Phuong Trang, president of Daikin, told VIR. Seeing the potential, Japanese giant shopping mall developer AEON Mall Co., Ltd. held the ground-breaking of AEON Mall Hadong a few days ago, marking the fifth AEON Mall for Vietnam and the second in Hanoi after AEON Mall Long Bien. In a similar move, Idemitsu Q8 Petroleum Co., Ltd., a joint venture between Japan’s Idemitsu Kosan and Kuwait’s Petroleum International Ltd., opened the first foreign-invested petrol service station in Hanoi in October of last year. Idemitsu sees Hanoi as a springboard to expand its business to other cities and provinces, hoping to become the leading brand for petrol services in Vietnam. A few months earlier, Japan-headquartered Daiwa-SSI and its Vietnamese partner CVI Cosmetic & Pharmaceutical Co., JSC (CVI Pharma) received an investment certifcate to develop a pharmaceutical factory in Hanoi’s Hoa Lac High-tech Park. “Acquiring 20 per cent of CVI Pharma, Daiwa-SSI will help us connect with potential Japanese and Taiwanese partners, thus enabling us to approach new technologies and export products to these markets,” said CVI Pharma chairman Phan Van Hieu. Industry insiders said that with the signing of the Comprehensive and Progressive Agreement for Trans-Pacific Partnership, Vietnam is expected to see a new wave of investment from Japan, with Hanoi being deemed one of the most attractive locations. Last year, 65.1 per cent of Japanese firms in Vietnam reported profits. Meanwhile, the latest survey on the performance of Japanese businesses in Asia and Oceania – released recently by the Japan External Trade Organization (JETRO) – stated that around 70 per cent of Japanese businesses in Vietnam are planning to expand their business here to cash in on the huge growth potential. As of late 2017, Hanoi attracted an accumulated $27.64 billion worth of FDI. Japan ranked second among Hanoi’s foreign investors with an accumulated registered capital sum of $5.38 billion; having surpassed South Korea, Japan ranked only below Singapore. Overall, 75 per cent of Vietnam’s Japanese-affiliated projects are solely invested by the Japanese side, while the rest are joint ventures – as per the requirement in some sectors, such as logistics. Meanwhile, 65 per cent of Japanese-invested projects in Vietnam are located in industrial parks and high-tech parks.